Let’s not muck about... Zonoscope is a fine record; It's the sound of a band in rude health and one that includes the sort of alt-dance sounds that will murder the awkward and the hipster with the brutal efficiencies of its big, bounding baselines. Single Take me out is a prime example, a brilliant piece of wizz-poppery that essentially smacks you repeatedly in the face with its jubilant riff and gliding vocals (though, it must be said, it’s a far more pleasant experience than such a description makes it sound). 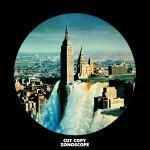 But, and there is a huge but, once this dirty deed is done and the aforementioned hipster traits are sinking to the bottom of a very deep lake with legs of stone, it slowly dawns that this LP marks a change of pace for Cut Copy. First and foremost they have largely cast aside their dance-rock label in favour of shinier synths and an 80s revival sound. So too, many songs have a far mellower, more psychedelic quality; one that features more heavily in the second half of the record. Songs like This Is All We’ve Got prove even at the very extremes of this new found approach this band still have what it takes to create songs that, once warmed to in this case, hold their listener with ease. It seems a shame then that in making an album of jumbled contrasts, the subtlety that Cut Copy may have sought on this record has been the fall-guy. Sun God for example, the fifteen minute finale to Zonoscope, slides steadily from cheerful and ultra-produced towards raw trance and low frequencies in a near deadening fashion; one akin, I imagine, in its sheer mindlessness only to that of a Westlife concert (hang-about that is pretty offensive – its not that bad, but not far off). More importantly, however, Cut Copy are back, and back with enough danceable synth-pop to flatten the sensitive Bombay Bicycle Club member in all of us - but only just enough. With that all out revivalist aesthetic leashed and a far more frugal distribution of barefaced melodies and barbed hooks employed, Zonoscope remains a bubbling, immiscible concoction of sounds that feels very distinctly good, just not quite great.